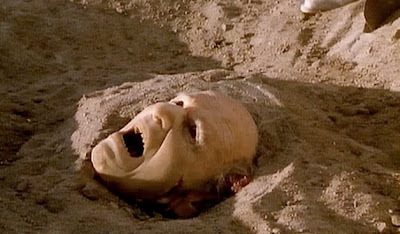 The Horror Digest: Tremors: Jaws in the Dirt. 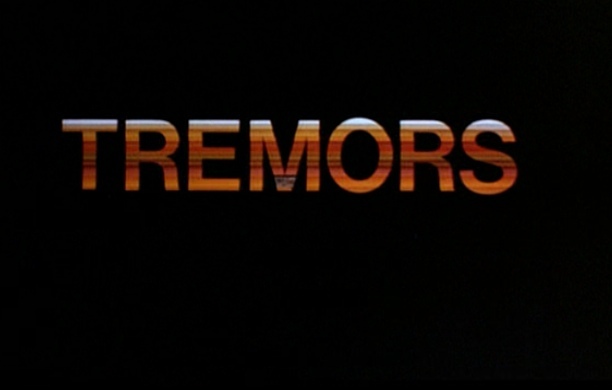 I won't pretend that I wasn't terribly nervous to finally watch all of Tremors. While en route to Florida when I was in the 2nd grade, my entire family--holed up in one hotel room, (I got to sleep on the cot, yes!) 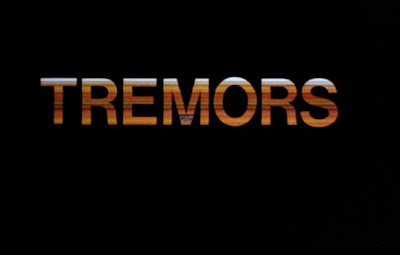 decided the time was ripe for a family viewing of Tremors. 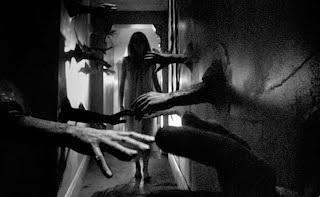 Being young, and scared of big things that randomly pop up out of the water er dirt--I was easily traumatized and spent the entire movie hiding beneath the bed sheets. 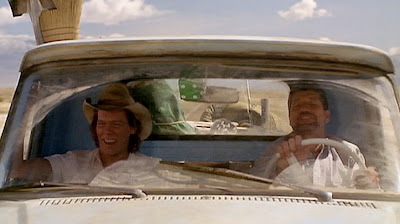 Since then, I caught bits and pieces of Kevin Bacon's romp in the desert but never sat down to watch the whole thing. Lately people keep talking about Tremors and its, for lack of a better word--awesomeness, that I decided I needed to remedy the situation. Luckily my phobia of things that pop up out of nowhere is limited to the water. 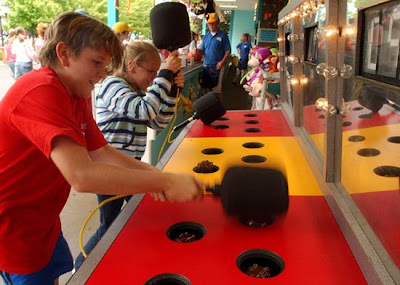 I was worried that it would be EVERYTHING but thank god---I can sleep soundly knowing that Whack-a-Mole is still safe. 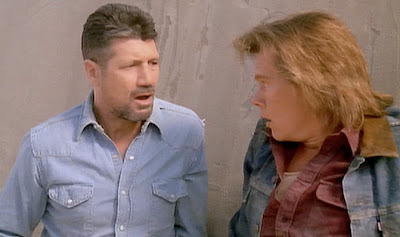 Also, good thing I did remedy the situation because Tremors is seriously the bees knees. It's one of those comedy-horror hybrids that isn't over the top in any one way. The comedy aspect isn't it riddled with the dreaded "silly music" and I was practically jumping up out of my seat anytime someone stepped onto the ground. 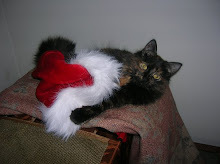 And don't tell anyone, but I totally jumped when they found a hat, picked it up and found THIS under it. But that's mostly because I expected a shark to be underneath it. 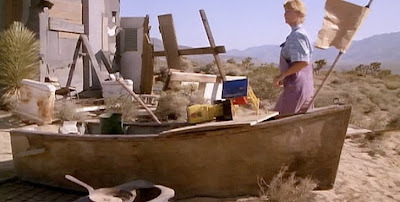 In case you live in a box--Tremors is about Graboids that infiltrate a small Nevadan town. What is a Graboid? This is a Graboid. They travel like lightning through the dirt, and eat you. They also can find you due to the vibrations you make--this means no walking, talking, or putting sand and bullets in a loud machine and turning it on. 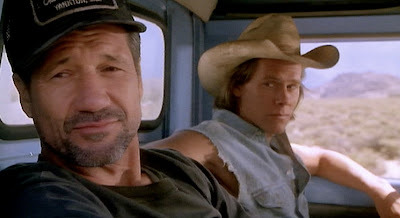 Yes, Tremors is all sorts of awesome. 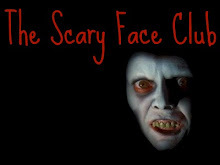 I also couldn't help but remember how extremely terrifying this movie was to me as a 2nd grader. When I was little I seemed to connect every character that was in a movie to a real living human. There seemed to be no separation from what was happening to them on screen and what happened to them in real life. This is what made most of Tremors so hard for me to stand. I felt so BAD for the old man that died, and the husband and wife that got killed early on practically made me want to cry. And of course I had a meltdown when the sheep and the horse bit the big one. Much of it is pretty scary if you stop and think about it. It all goes back to the shark attack trauma. What is happening down there once you get pulled under? Does a Graboid slowly digest you for over a thousand years like the dreaded Sarlaac? Probably. In fact I couldn't help but notice just how insanely similar Tremors is to Jaws. On purpose I assume, it's clearly one of those Jaws prototypes, like Alien. 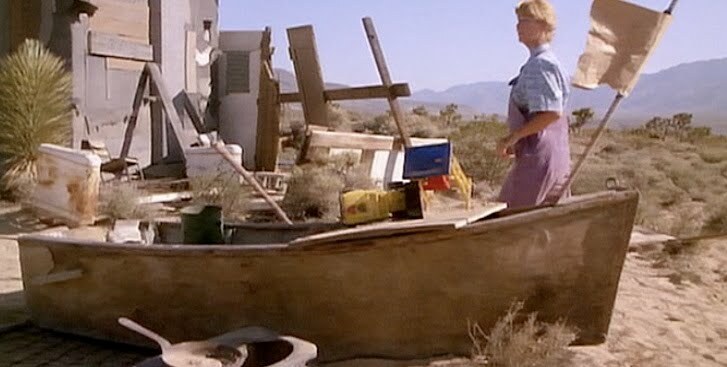 Nearly everything is a reference to what happens in Jaws--heck, there's even a wooden boat randomly in the desert! People think they're safe in large wooden structures, which turns out to be FALSE. Nobody has any idea what is killing people and so the crime gets falsely attributed to boating accidents or serial killers. An explosion is used to kill the beast, resulting in raining beast debris. People run/swim away from the beast as the thing they are running on gets quickly demolished. Point of view shots, beasts acting all smart, people getting pulled into the beast's mouth right in front of them and they watch as said person get devoured. 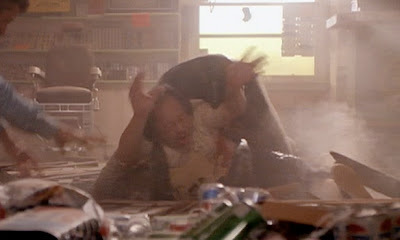 It's a very open shut case, and kind of makes me appreciate Tremors even more. The best part though? 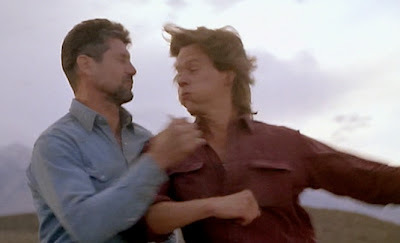 Easily the camaraderie of Kevin Bacon and Frank Ward. Jeez, I have a lot of poster requests for my bedroom lately. Well, let's relive the magic! Sigh. Magical. Anywho Tremors is frickin sensational. I can't believe I lived so much of my life without having properly seen it, what was I thinking?! It's just a full on amazing adventure. 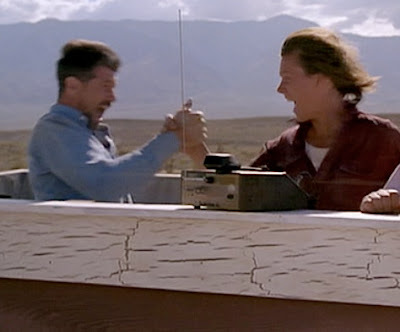 There weren't any low points, character's were entertaining, anxiety ran high and the Graboids are frickin sweet as Jesus. 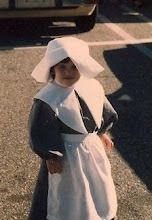 Like really--sweeter than Jesus. It even made me cry a little to think that such a large and monstrous beast was created mostly without the aid of CGI. It really makes you appreciate the finer things in life. 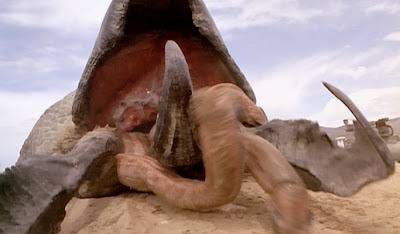 I shudder to think what a remake of Tremors would look like... probably something dreadful. Maybe that's the main downfall of a monster movies made to day. People think that to create an exciting tale about monsters, you need a monster that is entirely mobile. 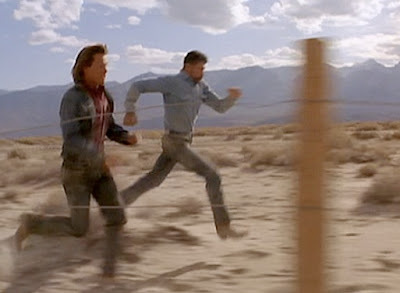 A film like Tremors is proof that monsters with less physical agility and that just look impressive are sometimes more exciting than ones that can run and do backflips. 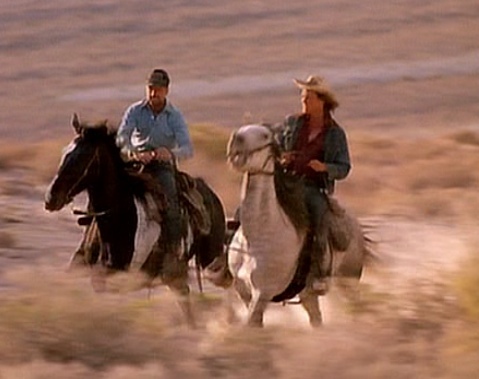 Ah yes, thank you Tremors for reminding me what I love about horror movies--being wildly entertained. 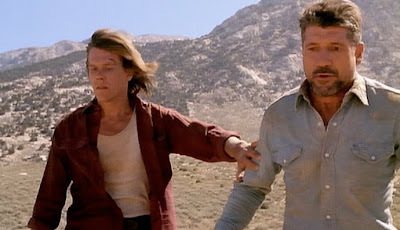 I love me some Tremors - one of the beast creature features to come along in the last twenty years, no doubt! Can't wait for the blu-ray next month. Val and Earl posters? AWESOME!!!!!! Yeah, this movie is all kinds of awesome. Very awesome little movie, so many times I have run across it on the tv and just had to watch it. At this point I'd like to point out that the ground-burrowing zombies in the new Resident Evil movie have Graboid faces. Seriously. 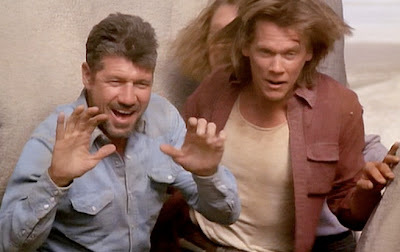 Loooooove Tremors. So much good clean fun, with an incredibly likable cast. Good times all around indeed! Oh, and who knew pole vaulting was such a useful life-saving skill? Yeah pole vaulting!! I should have brought that up, I just got so distracted when talking about my favorite bro-mance in the whole world. I have a feeling I would be TERRIBLE at pole vaulting. I would be like Earl and just immediately fall backwards. 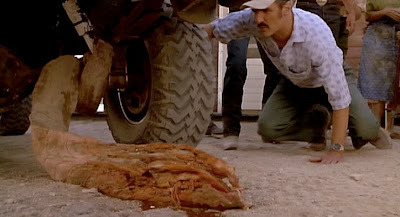 The thought of doing it over Graboid infested dirt keeps me up at night... I better start practicing now! I imagine it involves a lot of upper arm strength, and you know...we're silly girls and most likely don't have that. It's sooooo much easier to have to grizzly yet handsome and charming men take care of it all, right? Ugh. I have the worst upper body strength. I think I broke it by carrying massive boxes of cat litter back to my apartment from CVS. Don't tell anyone but my sister and I got our hands on one of those old lady push carts---works wonders on cat litter transportation. But ummm crap I need to start working on my arms if I want to survive! Psst. It's cool. Those old lady carts a necessity in NYC. As for upper arm strength, I had an intense argument with my boyfriend recently while watching Frozen. No spoilers, but let's say there's a point where being able to hang from a rope and climb across is called for. I said, plain and simple, that I'd be dead because there's no way I could do that (similar discussion during The Descent). He said of course I could do that. He is wrong. After going to a playground recently and attempting to swing on the monkey bars, I can say with certainty that I cannot do that. No way. Hey get out of my brain! 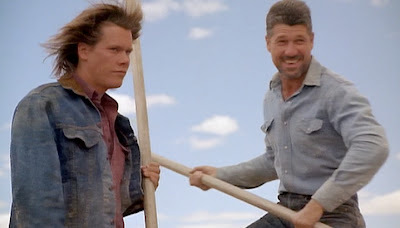 I was seriously thinking about doing reviews of all the Tremors films for my own blog. Anyway. 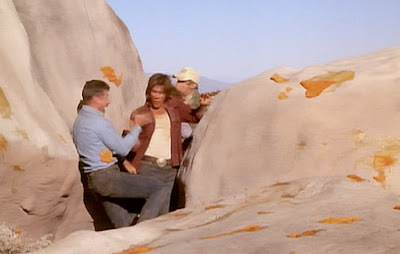 Tremors is a huge favorite! I mean, HUGE. Hilariously funny, and still a faithfully well-done creature feature. Love, love, love, love it.